It has finally arrived. The long expedition to Jackson Hole, Wyoming begins in one hour. 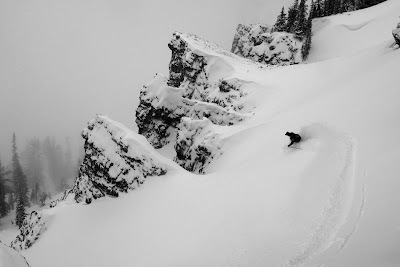 If our condo has whiffy, the next update on this will be coming from the Teton Village, and we will be in the great Valhalla of boarding and skiing. Then in Jackson, some Boloneys will be. And now the big trip they’ve been waiting for all year. With the adrenaline pumping they won’t even yawn. With 400 inches, there’s no chance of a thaw. And lots of food and sauce will surely be had. Corbets looks scary, I’ll try not to be a skeptic. No worries, there’s power in the shred vest! A Power Seen production you all want to see. Shredding the West like BOOM DONE! And things are looking real nice at the Hole - 7 inches in the last 24 hours. Coming off my huge victory at Liberty this past weekend, my onesie radar has been on in full effect. Like a message through the cosmos, I was compelled to check out Snowbird today. Truly an amazing outfit. Bravo Sir, bravo. Just because it's from 2007, there's no reason this article can't get you psyched about what the Hole has to offer. How many people do you know that pay for the privilege of jumping two stories into a pitched couloir so gnarly that it was considered unrideable in the 60s. Even better, some of us may attempt it on snowboards - not exactly ideal, or graceful. 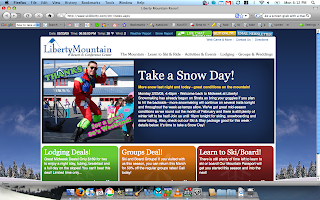 "Our mountain is like nothing you have skied before! It is huge. You could become lost. You could make a mistake and suffer personal injury or death. Give this special mountain the respect it demands!" Check out this Forbes' article by Christopher Steiner titled: "Corbet's Couloir: America's Scariest Ski Slope." I've highlighted a few choice passages, but click here to read the full thing. 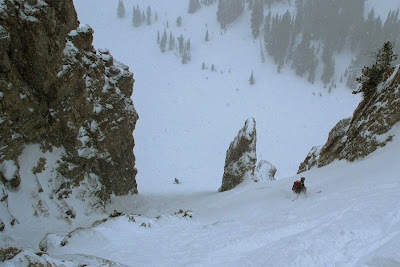 No ski resort in North America has a chute so legendary as Corbet's Couloir in Wyoming—a crucible where skiers go to prove their mettle (or more often, to retreat in fear). The run is named for Barry Corbet, a mountaineer who in 1960 spotted a narrow crease of snow shaped like an upside-down funnel, high up on the mountain now known as Jackson Hole. Said he: "Someday someone will ski that." You enter the chute's narrow, flinty mouth in free fall, dropping two stories onto a 55-degree slope. Fail to execute a hard right turn immediately, and you smash into a face of Precambrian rock. Survive, and you then smear speed by executing two nervy turns, exiting down a 45-degree slope as the chute fans out. The first turn is the problem: Skiers have gained so much speed so quickly that some panic and try to stop; this tactic is unwise at 40mph on so steep a slope. I barely survived, landing in the couloir in a cloud of snow and detritus and almost losing control. But with a twist of my body and some luck, I held on and emerged to plant a reasonably assertive tandem of turns, then skied out the chute. As Steep & Deep's coaches say, "Don't stop—stand up and ski!" Camp coaches aren't shy about shoving skiers far outside their comfort zones. "That's why you're here, right?" says Richard Lee, head coach, to a roomful of campers the night before skiing starts. His question elicits nervous smiles. Danger isn't just accepted here, it's embraced. In 1999 Jackson opened up its treacherous, unpatrolled back country to anyone who wants to risk it. Jackson closes. Anticipation builds. 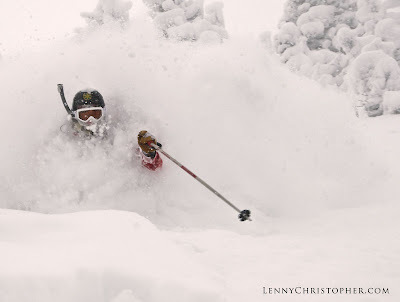 They've been getting snow all week and call it 8 inches in the last 24 hours and 14 in the last 72. This mountain is going to be in good shape to get boloned. Next week's forecast calls for chance of showers every day with some days suggesting real accumulation. It's Jackson Hole though. They call for chance of snow and get 3 inches. They call for a 3 inches and get a foot. This is Dong Stül checking in because Power Seen lives very far from all things that are good. 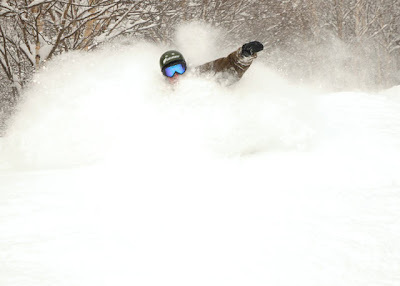 This past weekend we were given another lucky dose of northeast goodness. As happened before (I may have mentioned it at the time), Power Seen was trapped in the swamps of DC and the dirt covered trails of Liberty PA. While a fashion show victory may provide One Power Seen with some justification in his mind, there is just no comparison to waist deep and fluffy. Since we were all busy enjoying the conditions, very little documentation was obtained, however AtheFilter was able to come up with the clip below as proof of what we experienced. And did I mention Power Seen wasn't there...again. So we might be headed to Jackson shortly, but the East still has many things that are good. 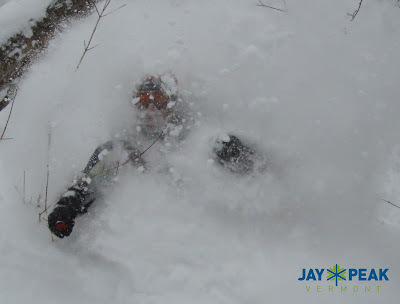 Huge storm last weekend and Vermont got hit hard. Here are a few shots (not mine, don't sue) that really got me pumped.